The TVS Apache RTR 160 4V has been launched with single-channel ABS in India. Just like the TVS Apache RTR 200 4V, the company will offer the RTR 160 4V in two different variants - Carburettor and EFI. The carb rear disc and rear drum variant are priced at Rs 92,785 and Rs 89,785 respectively, while the fuel-injected version costs Rs 98,785 (all prices, ex-showroom, Delhi). 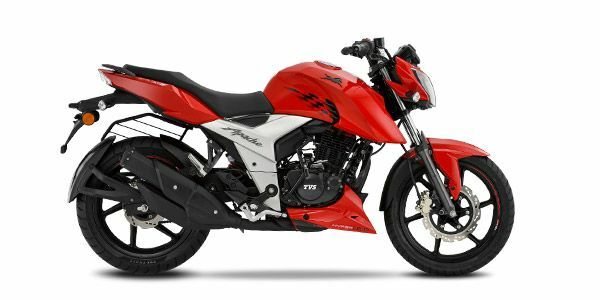 TVS Apache RTR 160 4V prices start at Rs. 83,145 (Ex-Showroom) and the top end variant TVS Apache RTR 160 4V Fi ABS is priced at Rs. 98,785 (Ex-Showroom). TVS Apache RTR 160 4V is available in 6 variants and 3 colours. The claimed ARAI mileage for the TVS Apache RTR 160 4V petrol is 60 kmpl. Known for its quick handling dynamics and rev-happy engine, the TVS Apache is one fun-to-ride motorcycle in its class. Q. I need a daily commute bike with in a budget of 1.20k and need a mileage upto 45 km. Which is better between Pulsar 180F, RTR 160 4V and FZ S V3? RTR 1604V IS BETTER IN MILLAGE, BUT LAC IN POWER THAN 2004V. Q. In both apache 160 4v Carburetor version and FI version, which provide the more mileage? Fi will give you better mileage. Little Red goes for a weekend trip to Mumbai and comes back to Pune. All in 24 hours! The TVS Apache RTR 160 4V draws its design from its elder sibling, the Apache RTR 200 4V. Among the many components that are common between the two include the headlamp with LED DRLs, the all-digital instrument cluster, fuel tank, side panels and even the LED tail light. However, the RTR 160 4V makes do with a single-piece saddle and single-piece handlebar instead of the split seats and clip-on handlebars seen on the bigger bike. TVS has given ABS a miss for the time being too. That said, the TVS Apache RTR 160 4V boasts of top notch quality and fit-finish. TVS is offering the new Apache RTR 160 4V with two engine options - EFI and Carbureted. The fuel-injected version of the 159.7cc, oil-cooled, single-cylinder engine with 4-valves produces a segment-leading power output of 16.8PS. The carb version, on the other hand, puts out 16.4PS. Torque figures remain the same on both variants - 14.8Nm at 6500rpm. When compared to the older model, the new bike makes 1.4PS and 1.7Nm more. The Apache RTR 160 uses the same split cradle frame as the RTR 200. The telescopic front forks and the rear monoshock unit were developed in partnership with the Japanese firm Showa. The fuel-injected version of the RTR 160 is brought to a halt by 270mm front and 200mm rear petal discs. The carb version, on the other hand, gets a 130mm drum unit at the rear. However, TVS is offering a rear disc brake as an optional accessory. Suzuki Gixxer: The Gixxer’s engine and suspension have been developed under the watchful eyes of the same designers who also produced the Suzuki GSX-R series. This is a worthy city-based sporty 155cc bike with distinct design and enviable refinement. Yamaha FZ V2.0: The V2.0 delivers in style, build quality, refinement and handling. It is also the only bike in the segment to get fuel injection, but that has also upped its price out of this league. It is a strong performer and a proper upgrade to the previous version. Bajaj Pulsar NS 160: The Pulsar NS 160 ticks all the right boxes when it comes to style, performance, ride and handling, save for refinement. The new NS 160 is a worthy contender and makes a strong case for itself in this highly competitive 160cc segment. Honda X-Blade: The X-Blade is Honda’s third product in the 160cc category and sits in between the Unicorn 160 and the Hornet 160R. Its long list of features give it plenty of oomph factor. But we are still to test it to understand its positioning between the commuter-friendly Unicorn 160 and the sporty Hornet 160R. If a bike has to survive in the cut-throat 160cc two-wheeler segment, it needs to be competitively priced and pack enough performance to keep riders happy. Thankfully, the Apache RTR 160 4V delivers well on both fronts with class leading features and a price tag that starts at Rs 81,490 (ex-showroom for carb, single-disc variant). However, it doesn’t feel as confident under hard braking as the Bajaj Pulsar NS 160 or the Honda Hornet. That said, the Apache RTR 160 4V is not only the most refined RTR we have ridden till date but also one of the most refined 160cc motorcycles to be ever produced in India. Good bike as well, Easy to handle for any riders.. abs must be done mandatory to this bike.